Legacy lets you explore your creative streak. Molyneux's been a bit press-shy over the last couple of years, and he says he's learned his lesson about announcing games too early. That was far from the only problem with 22cans' two duds, Curiosity and Godus, though The Trail seemed a lot better thought out. In the initial reveal from Red Bull Gaming—watch it below—we see a lot more of Molyneux and his fellow designers than we do the game, though you can still see it in action. I will never, ever grow tired of management sims, but I confess that, while I'm crunching numbers, obsessing over charts and fine-tuning manufacturing and supply chains, there's part of me that would rather be creating. Legacy promises both. 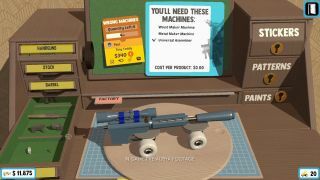 The workshop lets you combine various parts and objects to create new inventions, practical or otherwise. Normally it doesn't really matter what your business sells in this kind of tycoon game. Potatoes, guns, self-sealing stem bolts—all that matters is how much profit you can make. But in Legacy you're building your whole business out of stuff you've made by hand, and that sounds rather appealing. And also maybe a bit more devastating when you discover that the world isn't ready for skateboard-guns. The world itself also looks like it was invented in a workshop. Diminutive and brightly coloured, it resembles a quaint model village. That doesn't mean it's all smiles and sunshine, however. Expect moral conundrums as your decisions affect staff and the world beyond your company. As you expand the business beyond your shed and start hiring staff and building factories, you'll need to decide what kind of boss you want to be. Legacy doesn't have a release date or confirmed platforms yet, but 22cans' games typically appear on mobile and PC.